Census results conflate some speakers with Hindi. Bagheli (Devanagari: बघेली or बाघेली), or Baghelkhandi, is an Indo-Aryan language spoken in the Baghelkhand region of central India. An independent language belonging to the Eastern Hindi subgroup, Bagheli is one of the languages designated as a 'dialect of Hindi' by the Indian Census Report of 2001. Bagheli is a regional language used for intra-group and inter-group communication. Like many other Indo-Aryan languages, it has often been subject to erroneous, arbitrary, or politically-motivated designation as a dialect, instead of a language. Furthermore, as is the case with other Hindi languages, Bagheli speakers have been conflated with those of Standard Hindi in censuses. 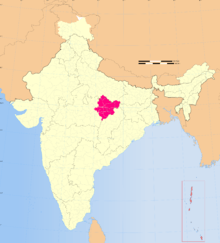 Bagheli is primarily spoken in the Rewa, Satna, Sidhi, Shahdol, Umaria, Anuppur and Jabalpur districts of Madhya Pradesh; and Allahabad and Mirzapur district of Uttar Pradesh the Bilaspur and Koriya districts of Chhattisgarh. The Pao, a scheduled tribe also known as the Pabra, speak Bagheli as their first language. Their language was mistakenly reported to be Tibeto-Burman by Ethnologue, perhaps due to confusion with the Pao language of Burma. There are several radio and TV programmes in Bagheli. All India Radio is broadcasting Bagheli songs and agricultural programmes from Shahdol, Rewa and Bhopal. Furthermore, courses pertaining to Bagheli literature are available to be studied at Awadhesh Pratap Singh University. ↑ Hammarström, Harald; Forkel, Robert; Haspelmath, Martin; Bank, Sebastian, eds. (2016). "Bagheli". Glottolog 2.7. Jena: Max Planck Institute for the Science of Human History.